When her 11-year old son, Joe, was diagnosed with Hodgkin’s Lymphoma, Dina Isola quickly realized the value and importance of having a dedicated children’s hospital in Suffolk County. “When your child is facing a serious illness or injury, you can’t get help fast enough,” said Dina. “And of course you only want the best.” Now, thanks to his medical team at Stony Brook Children’s Hospital, Joe is cancer-free. Out of her gratitude and belief in the importance of Stony Brook Children’s to her community, Dina agreed to serve on the Stony Brook Children’s Hospital Task Force with 22 other local leaders — including esteemed and longtime Stony Brook friend Pamela Della-Pietra — who together helped inspire more than 3,000 community members, companies, foundations and labor unions to support the new 71,500-square-foot children’s hospital building. Two lead matching gifts helped bolster the work completed by the Task Force. The first was led by an anonymous donor. The second was brought about via the Knapp Swezey Foundation, venerated at Stony Brook for their continuous giving. Thanks to these matching gifts, Task Force leadership and your philanthropy, $25 million was raised in support of the $72 million Stony Brook Children’s expansion. Scheduled to open in 2018, the new building will feature all-single patient rooms, a pediatric intensive care unit and medical surgical beds, family amenities, playrooms, teen spaces and more. James Coughlan, principal co-founder of TRITEC Real Estate Company and task force member, believes it’s the sustainable and tangible impact on future generations that has driven such community support. “It’s mind numbing what the hospital, as a whole, is doing. Most of us have been fortunate enough to not need those cutting-edge technologies as they’re coming out, but to know that they’re here is phenomenal,” he said. Fellow Task Force member Mario Mattera, business agent for U.A. Plumbers Local Union 200, echoed Coughlan’s sentiments. “Stony Brook has become a one-stop-shop for area residents. It’s my hospital. Why go somewhere else when you have the best here, right in Suffolk County?” he said. Plumbers Local 200 was just one of five area trade unions that donated in support of Stony Brook Children’s. Others included Ironworkers Local 361, Electrical Local 25, Operating Engineers Local 138 and Steamfitters Local 638. Combined, the unions represent more than 5,000 New Yorkers and Long Islanders, a testament in and of itself to the power of community. Dexter A. Bailey Jr., senior vice president for Advancement at Stony Brook University and executive director of the Stony Brook Foundation, views philanthropy as the driving force for excellence among every great university. “Watching everyone come together to support the specialized pediatric care that families and children of Suffolk County need has been inspirational. This tremendous accomplishment establishes that together we will achieve great things for our community,” he said. Stony Brook Children’s first launched in 2010 and currently boasts 180 top pediatric physicians, 250 pediatric nurses, child life specialists and social workers and receives more than 8,000 patients and performs more than 3,700 surgeries each year. Since its opening, the children’s hospital has been recognized for its 24-hour pediatric emergency room and renowned neo-natal intensive care unit. The hospital is the Regional Perinatal Center for the area and is home to the nation’s first Pediatric Multiple Sclerosis Center and also offers a Pediatric Hematology/Oncology Program, Pediatric Cardiology Program, Pediatric HIV and AIDS Center, Cystic Fibrosis Center and Comprehensive Duchenne Muscular Dystrophy Center. 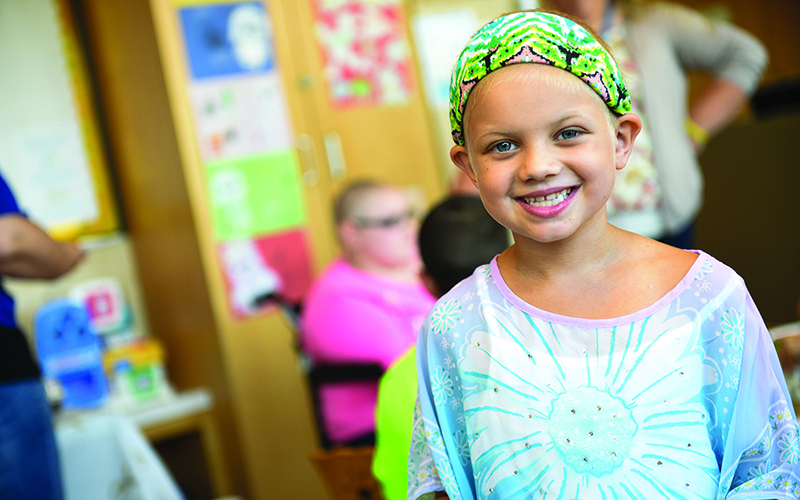 The children’s hospital also conducts advocacy efforts, including outreach and prevention programs and provides resources for local support groups and chapters of national organizations. Margaret McGovern, MD, PhD, physician-in-chief at Stony Brook Children’s Hospital, and who was also recently named the inaugural Knapp Chair in Pediatrics, noted despite the highly competitive field of pediatric specialists, more and more top doctors and researchers are attracted to the caliber of talent and the sophistication of the facilities found at Stony Brook Children’s.